Can 3-D Printing Turn Space-Based Solar Into a Reality? NASA is investing, but cost is still the question. Space-based solar power has been a futuristic fantasy since the 1970s but the advent of 21st century 3-D printing may bring it a step closer to reality. 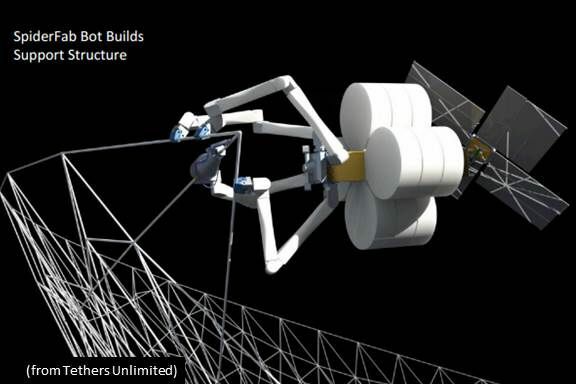 “The overall vision is to create a ‘satellite chrysalis’ with compact, durable ‘software DNA’ assembly instructions, and the ability to fabricate space system components on-orbit instead of building them on the ground,” explained Rob Hoyt, CEO and Chief Scientist of startup Tethers Unlimited, Inc.
TUI has won two rounds of funding for its SpiderFab 3-D robotic printer from the NASA Innovative Advanced Concepts (NIAC) program. A $100,000 award allowed proving of the technical feasibility and value proposition of the technologies and won TUI a $500,000 award to continue development. 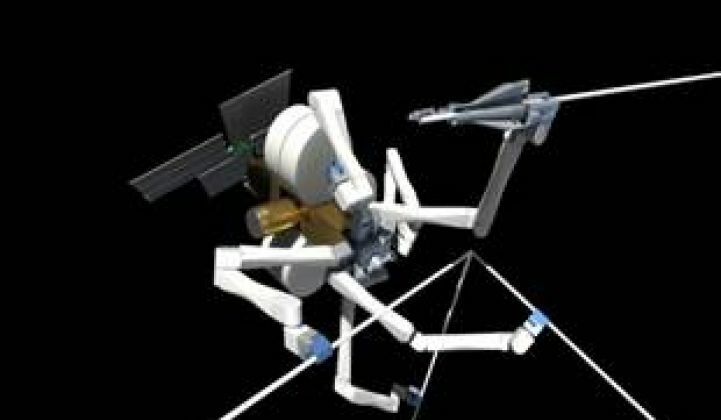 3-D printing and robotic construction of components on-orbit would allow a smaller, less expensive launch rocket that will “improve performance per cost by orders of magnitude,” Hoyt said. For space-based solar power (SBSP), there would be two basic steps, Hoyt explained. First, the 3-D printer would build a carbon fiber truss structure that would act as a frame for the system. It would then lay a membrane on the structure of either thin-film PV or reflecting materials, if concentrating solar power was being deployed. “We haven’t yet looked in detail at space-based solar,” Hoyt said. 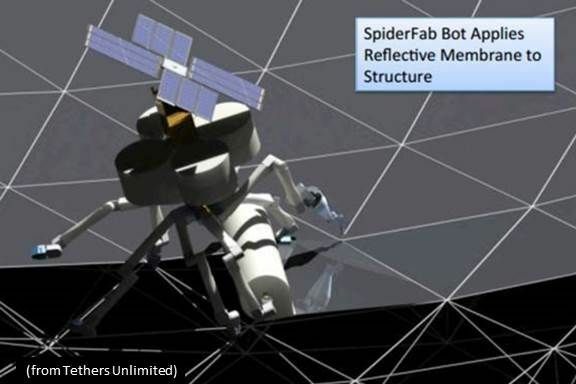 But a just-completed design analysis for a 300-kilowatt orbital solar array verified that SpiderFab can provide the projected tenfold decrease in stowed volume and 50 percent to 80 percent reduced mass. TUI also developed a lab version of the device that would fabricate the truss structure in that analysis. “Geostationary solar could produce baseload electricity for 99 percent of the hours of the year,” explained NASA Apollo 11 lunar landing vehicle manager Hubert Davis, a member of the Solar High Study Group of nine former NASA and Apollo program scientists and retired military leaders that advocate for SBSP. The Solar High Group is working “to put together a consortium of government and industry,” Davis said. The first step would be funding to update the Boeing/North American Aviation studies done in the 1970s. They looked at technology feasibility, environmental impact, land use, manpower needs, energy payback, and estimated costs and confirmed the concept was “technically feasible with no new science” but found it would be too expensive. Cost has been a major obstacle to the Solaren Corporation’s efforts to commercialize SBSP. The Japanese Aerospace Exploration Agency has also worked on it. 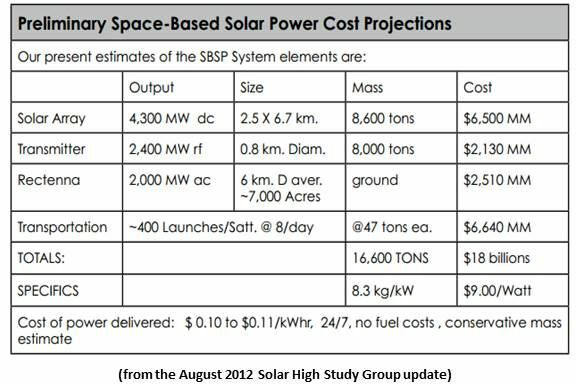 The delivered cost of power from SBSP, according to August 2012 calculations by NASA Apollo program engineer Philip Chapman, would be $0.10 to $0.11 per kilowatt-hour. At scale, the launch cost would be between $0.008 per kilowatt-hour and $0.023 per kilowatt-hour of the delivered cost, according to Chapman’s July 2013 update. With the reductions in volume and mass promised by 3-D printing, those launch costs could be significantly reduced, though Hoyt could not comment specifically on SBSP and Davis’ group has not yet considered the impact of the TUI technologies. Cost is not the only challenge SBSP faces. But the maximum radio frequency intensity of the transmission “is only one-fourth that of sunlight,” according to former NASA wireless power transmission engineer Richard Dickinson. And the transmitter would be immediately shut down if there was any interruption at the earth station. “Aircraft can safely traverse the beam and tests have demonstrated that even the sensitive honeybee is unaffected,” Davis said. “The term '3-D printing' has become a catch-all for a number of purposes and different technologies evolving rapidly to do all kinds of things,” Hoyt explained. Boeing and GE are developing the capability to 3-D print aircraft components, he said, and smaller-scale applications are beginning to enter manufacturers’ supply chains.